Back in 1997 or 1998 we were living in Sacramento in a town house. One evening we went for a walk to look at Christmas lights and decorations. As we were walking, I saw this light ball hanging by someone's front door. I thought it was awesome. A year or two later, I found directions to make it but I never did. Every year I would have the best of intentions to make it. On several occasions I bought the cups to make it. Lights are never an issue. I have a plastic tote filled with lights. This is the card that brought me to 80. You can't really see from the picture, but I popped the wall up with dimensionals so that the fire and back of the fireplace are behind, recessed if you will. This isn't the best picture, but I'm going with it due to time. This one comes from a sketch I had from several months ago. I looked to see what stamp set I had out that would work with it and this is what I ended up with. 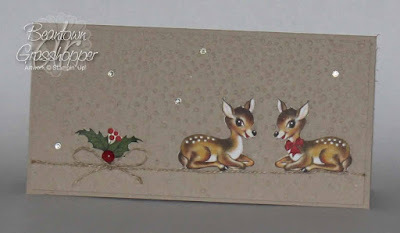 More reindeer from the Home for Christmas designer paper. 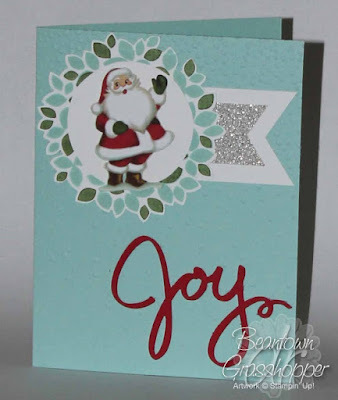 There isn't any stamping on this card. A little crooked on the crop, huh? 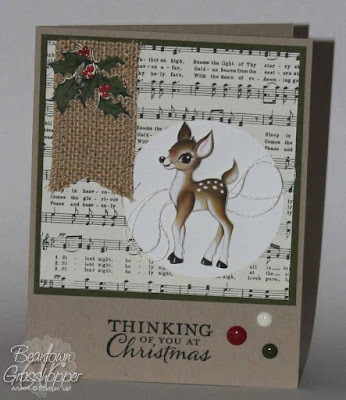 I saw this card on Pinterest and really liked it. There is something about these reindeer that make me happy and think of Christmas when I was a child. 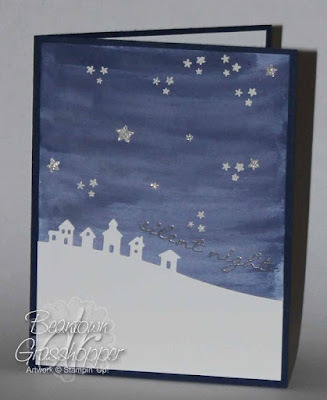 I color washed white cardstock with the Aquapainter and Night of Navy reinker. 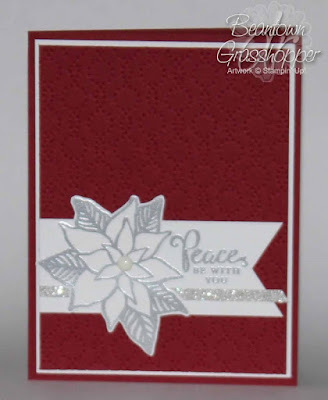 I embossed stars with white embossing powder and glued on some stars from the silver glitter paper that I had punched from scraps from another card. 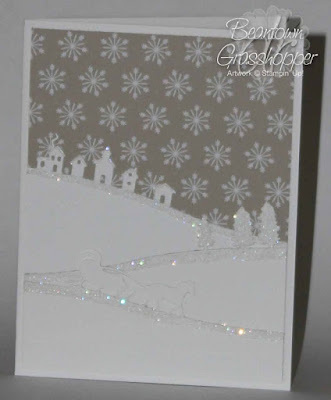 I embossed "silent night" just above the homes to the right. This is a pretty straight forward card. 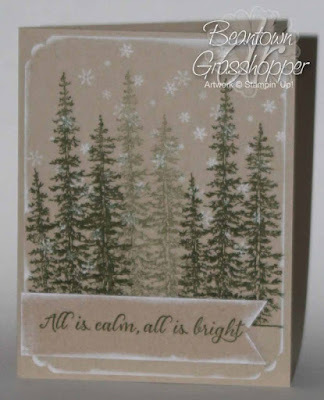 I pulled some paper from the Trim the Tree paper stack. I edged the roof tops, all of the trees and the curvy border with the glue pen and dazzling diamonds. It would be better to use dimensionals to make each layer pop, but I didn't want to risk having to pay more postage with several layers of dimensionals. This gem is CASEd from Mary Brown. I made 4 of these and 3 of the 4 have the red center but I ran out so this one has the cream center. It's all good. The overall card is pretty much the same. 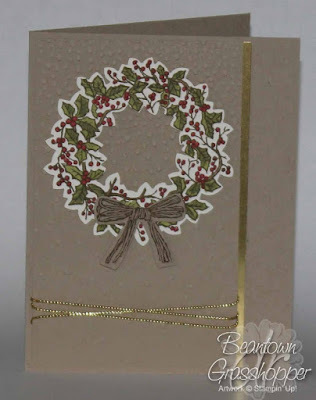 I think I added the gold foil strip on the side and I left it a full card. I used the blendability markers to color the wreath. 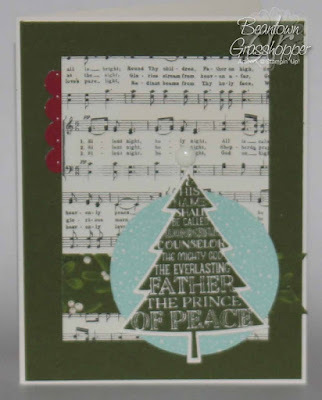 For the next 9 days, I'm going to share a card that is completely or mostly CASEd from Pinterest. 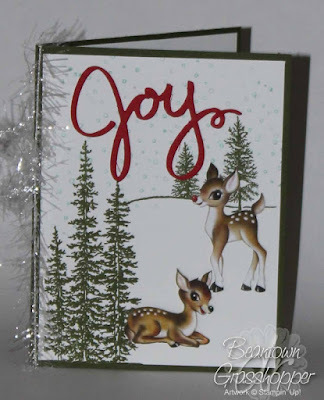 I started working on Christmas cards in October and I finished my 80th card Friday night. I still need more for local friends but this completes those that need to be mailed off. Yay! I'm NEVER done this early. There have been years I've had to mail our cards off in batches. So happy I can focus on other things and not have to worry about getting them made. 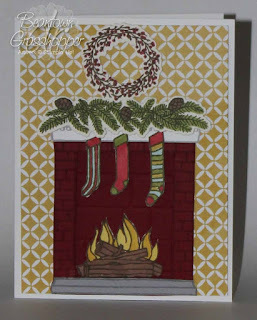 I think this card was inspired by a different set and my wanting to use some of the paper that I have.